Ever wonder how we got ourselves into this bottom feeder existence we call civilization? What is the covenant of Gaia? How do our extraterrestrial visitors play into this? What is their actual significance and who are the Corporate Titans of Orion? What is the connection with the Moorish Legacy and the Masonic Agenda? What is the true nature of our existence on this planet? How are the Sasquatch, the Krists and the Temple of Solomon relevant to our destiny in the modern world? Why are academic and religious perceptions of history so completely inaccurate? Why are we the constant target of human degradation? These questions and many more will be explored and answered by author and international speaker Richard Smith. 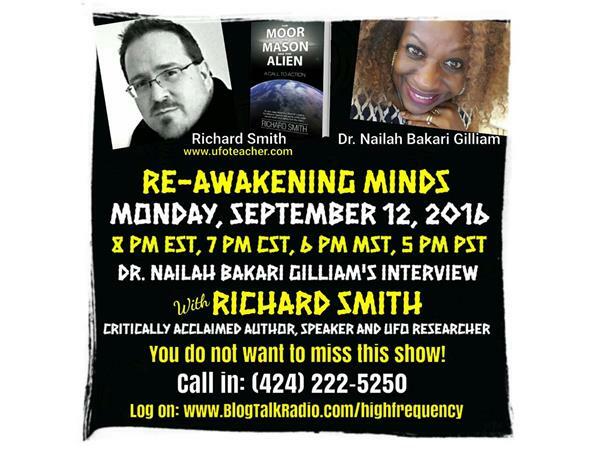 RICHARD SMITH is an experiencer, author and international speaker on the topic of alien contact, the Moorish Legacy, human origins and related matters. Smith received high honors at New York State University for his dedicated work with Extraterrestrial Intervention and Alien Abduction Phenomena. Globally recognized for spearheading the Human Origins Revolution, he currently resides in Albuquerque, New Mexico, working on his third book and has been speaking worldwide with author events, interviews, lectures and conferences.